The more the pigs pooped, the more the bananas grew. Sounds uncouth, but it’s true! Twagirimana is a 51 year old farmer whose son, Silas, is a sponsored child with Food for the Hungry (FH) in Rwanda. As such, Twagirimana was able to join a FH animal husbandry program and learn how to breed pigs. Upon completing the training, he also received a pair of pigs to get him started. Formerly a bean farmer, this new addition to his skill set opened up fields of possibilities. While beans are an excellent source of nutrition, planting conditions prevented Twagirimana from harvesting a big enough crop to feed his family and sell in the market. The beans barely sustained his children and provided no income. That’s where the pig comes in. As part of his training, Twagirimana learned how to use animal manure to enrich the soil in his fields. But instead of continuing to focus on beans, he decided to switch to a money-making crop - bananas! When his new pig began having piglets, the manure multiplied - and so did the bananas. His plantation grew. The family is now able to generate 15,000 RWFs per month from banana sales alone. With this income, Twagirimana can provide for his family’s daily needs. In the future, he hopes to be able to afford his children’s school fees, as well. But that’s not all pig poop can do! Twagirimana also applies livestock manure to their kitchen garden, which has increased their vegetable yield and improved family nutrition. Instead of just beans, they now eat a balanced diet every day. In addition to the banana plantation, Twagirimana’s income is rising due to piglet sales. His pig has already had 11 piglets which sold for 7000 RWFs each! Previously, the family was unable to afford medical insurance for every family member (they have seven children!). 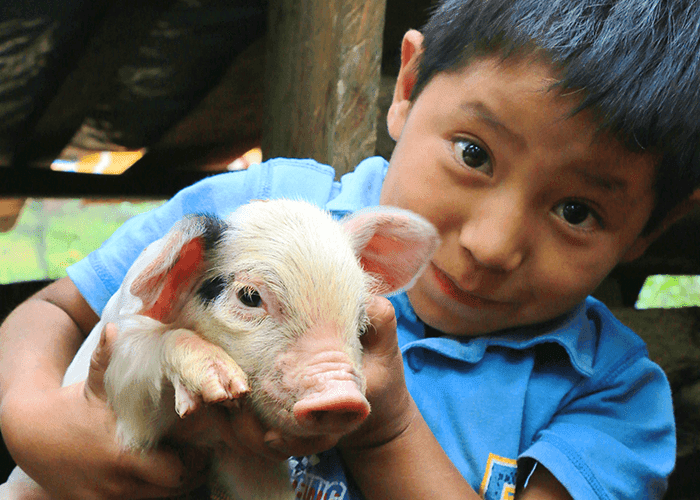 Since he sold the piglets, however, they have been able to pay their medical insurance, and have enough leftover to buy clothes and shoes for the kids. “That’ll do, pig; that’ll do."